Instead of filling shoeboxes full of pictures, consider organizing them with iPhoto on your MacBook. You can keep your entire collection of digital photographs and scanned images well-ordered and easily retrieved by using iPhoto’s Organize mode. Then you can display them in a slideshow, e-mail them, order prints online, print them to your printer, use them as desktop backgrounds, or burn them to an archive disc. An event is a group of images that you shot or downloaded at the same time — iPhoto figures that those images belong together. An event can be renamed, if necessary. Click the Events entry under the Library heading in the Source list to display your events in the Viewer; then click the existing event name in the caption underneath the thumbnail. A text box appears in which you can type a new name; click Return to update the event. Try moving your cursor over an event thumbnail in the Viewer and you see that iPhoto displays the date range when the images were taken, as well as the total number of images in the event. Things get really cool when you move your cursor back and forth over an event with many images: The thumbnail animates and displays all the images in the event! To display the contents of an event in the Viewer, just double-click the Event thumbnail. To return to the events thumbnails, click the All Events button at the top of the Viewer. 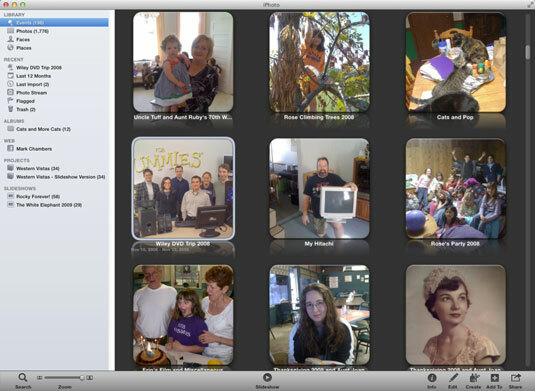 iPhoto has two organizational tools called Faces and Places. These two categories appear in the Library section of the Source list. First, let’s tackle Faces. This feature is a sophisticated recognition system that automatically recognizes human faces in the photos that you add to your library. 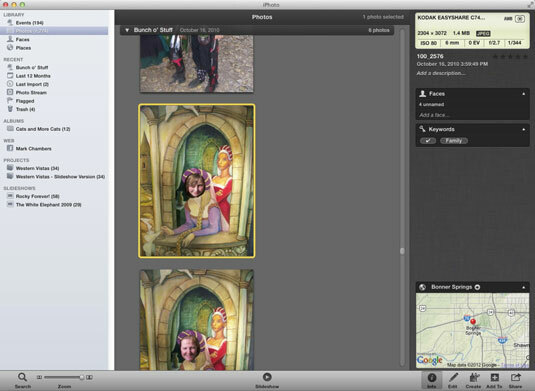 Naturally, you have to identify faces first before iPhoto can recognize them, also called tagging. In the Source list, click the Photos item to display your image library. In the Viewer, click the photo containing a person you want to tag. The photo is selected, as indicated by the yellow border. Click the Info button in the iPhoto toolbar at the bottom of the window. iPhoto displays the Info pane. In the Faces section of the Info pane, click the Add a Face link. Note that iPhoto has indicated each person’s face in the photo with a label. If a face has already been tagged, the label will match the person’s face. If the face is unrecognized, click the label to open a text box and type the person’s name. If iPhoto recognizes the face correctly and the name matches the person, click the check mark to confirm the tag. If the face is incorrectly identified, click the X at the right of the text box and enter a new name. If the name appears on a Contacts contact card — or is recognized as one of your Facebook friends — you can click the matching entry that appears to confirm the identity. Wowzers! To delete a face recognition box that isn’t necessary, hover your mouse cursor over the box and click the X button that appears at the top-left corner of the box. After you’ve identified all the faces in the photo, click the Info button to hide the Info pane. After you tag an image, it appears in your Faces collection, which you can view by clicking the Faces entry in the Source list. You can double-click a portrait in your Faces collection to see all the images that contain that person. 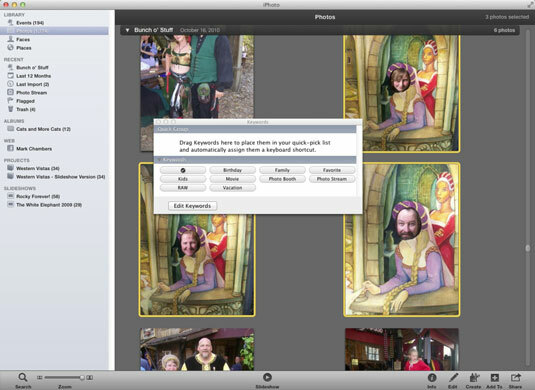 The more tags you add, the better iPhoto gets at recognizing that person! The Places feature makes it easy to track the location where photos were taken, but it requires a digital camera that includes GPS tracking information in the image metadata for iPhoto to do so without your help. Places also requires an Internet connection, because it uses Google Maps. Click the Places entry in the Source list to display a global map, with pushpins indicating where your photos were taken. You can switch the Places map between terrain and satellite modes, or choose a hybrid display. If you click a specific photo to select it and then click the Info button, you’ll see a close-up map of the location where the photo was taken. Alternatively, click the Location buttons at the top of the map to display a browser where you can click country, state, and city names. You can also assign descriptive keywords to images to help you organize your collection and locate certain pictures fast. iPhoto comes with a number of standard keywords, and you can create your own as well. Suppose you’d like to identify your images according to special events in your family. Birthday photos should have their own keyword. By assigning keywords, you can search for Elsie’s sixth birthday and all related photos with those keywords appear like magic! To assign keywords to images, select one or more photos in the Viewer. Choose Window→Manage my Keywords or press cmd+K to display the Keywords window. Click the keyword buttons that you want to attach to the selected images to mark them. Or click the highlighted keyword buttons that you want to remove from the selected images to disable them. To sift through your entire collection of images by using keywords, click the Search button on the toolbar, and then click the magnifying glass icon next to the Search box and choose Keyword from the pop-up menu. iPhoto displays a pop-up Keywords panel, and you can click one or more keyword buttons to display just the photos that carry those keywords.